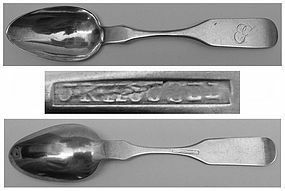 Offered is a rare and fine American coin silver teaspoon by Lewisburg silversmith John K. Housel. There were a number of Housels working as silversmiths and watchmakers in Pennsylvania over the course of at least two generations, and the relationships between these men are confusing and poorly documented. However, the Union County Historical Society, covering Lewisburg (which is north of Harrisburg) holds silver with this mark, attributed to John K. Housel. Housel is known from tax lists to have been working at least from 1823-45. John K. Housel may have lived from 1800-81, eventually moving to Iowa. He probably is related to Jacob Housel, watchmaker born in New Jersey circa 1786 and listed in Milton, PA in 1850. This spoon is in good overall condition, with some wear and dings to the bowl, but no splits or repairs. It measures about 5 9/16 inches in length and weighs about 14 grams. The maker's mark is lightly struck, as has uniformly been the case with the several examples of Housel's work observed over the years, but is legible. There is also a period engraved script monogram. All in all a fine small-town Pennsylvania piece from a rare maker!